If you’re using Micromedia (Shish Kabob) tools as your primary tool for thought leadership, then your efforts are out of balance. 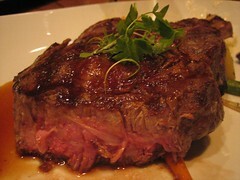 Add longer lasting, higher impact, larger form content now (Steak) content to your mix now. Your Mix Is Unbalanced: Twitter’s Limited Features are Overloaded. I’m seeing an unbalance in how individuals are trying to get the word out, and an excess focus on micro tools, resulting in some bad behaviors. In an effort to publish “Shish-Kabob”, brands and individuals have forgotten about “Steaks”. There’s been a change in media consumption. We consume smaller bits of information at greater quantity, and consume less long-form content. Five years ago, over dinner, Steve Rubel and I saw this change coming in which we identified as a shift from media diets away from Steak to “Shish-Kabob”. The challenge is, people and companies have shifted their social media mix so far to the left towards micromedia they’ve forgotten about long form content. Tweets Lack Persistence, Thereby Quickly Losing Value. Tweets are hard to find after being published, and diminish even further over time. For example, Twitter doesn’t make it easy to see and find older tweets, (see how searches on my own company are limited to three pages only), so I believe that data that you publish there becomes harder to find, and therefore less valuable. The net: If you’re investing a lot of time into Twitter, you are not wisely investing your time. Conundrum: To Stay Top of Mind, People Tweet more, Resulting In More Noise. While Lists are nice, and good nuggets won’t always arrive to the top of the stream, and as a result this encourages people to post the same message over and over to stay top of mind (and stream). As a result, the way Twitter is designed, those who publish the most (or get RTed the most) can actively stay at top of mind. Of course, there’s a limit, if you cross the (publishing too much rate), people may unfollow you. Taking a page from Chris Brogan’s suggestion to re-evaluate our efforts, I see so many people out of balance with their media mix, it’s time to rethink. Next, recognize that that there’s many tools at our disposal (and new ones arriving like Quora, Focus.com for global Q&A and Namesake, Path for personal use) and they all have a different purpose. These tools have stronger use cases for thought leaadership, archiving content, sharing tools, and connecting tools –Twitter is not longer enough. While every tool has a strength and weakness, and it’s important to use them in an integrated fashion. Here’s a sample of tools that individuals and companies should be integrating into their mix on a regular basis, in fact if you Tweet more than 20 times a day, you should have just blogged. Not just publishing tweets or linking to your latest corporate press release, I’m listing these tools from the top of the marketing funnel, down towards the more important call-to-action point. Appetizers: Source information in Q&A sites and Communities. While the primary use case is for these tools allow for individuals to ask questions and get answers, they are incredibly valuable in finding out where you need to focus your research, thought leadership and product roadmap. Use these tools not only to learn, but trigger discussions, share your own knowledge, and then identify contacts to followup with. Also see online communities where your customers are already located, like brand communities or IT Communities like Spiceworks, one of our clients. Entice The Market: Infographics are the New White Papers. I frequently say that Infographics are the new white paper, they spread further and are consumed by more people. Infographics are a key way to convey meaningful data to short consumption types, and are easy to spread to blogs, tumblr blogs, and FB wall feeds. See how Jess3, a design firm that specializes in creates these, and how a variety of brands are using these to get their content into the space. Feed the Information Starved Slideshare Community. Slideshare is a thriving community to share content, in fact, when I publish research reports (like this one), and webinars there they can get up to 40,000 views and 4000+ downloads. This tool has a thriving community already built in, so releasing higher quality content there makes a lot of sense. Be sure to use their embedded video Zipcast tool during launches of content. The Main Meal: Your Blog is an Central Platform, Use it Judiciously. Use your blog as your master archive tool, to collect information. Remember, while all content loses relevance over time, blog content is easier to find, and is centralized in a location closer to your own owned domain or URL, not lost into the ether. Finish With Dessert: Videos, While Limited In Consumption, Have High Engagement. See how Scoble uses videos to capture thought leaders in his interviews, these are longer form content that requires a lot of focus, but if you’re engaged, it’s the highest fidelity distribution on the web as you can capture a portion of the non-verbal communication. Or listen to this podcast interview I did with Jennifer Jones, it only takes a few minutes but it’s permeant archive. The downside to both video and audio? searching for the video content is difficult as the verbal words aren’t often translated into metadata, and because we’re shifting to a shish kabob media diet over steak it makes it difficult. To Regain Balance, I’ll focus on Fewer Higher Quality Tweets, and Less on Quantity. Twitter, while low cost to the user, makes sense as a quick broadcasting tool, but those that are trying to use it as their only thought leadership mechanism are missing out. Two years ago I began an exercise in self-control and took nearly 3 weeks off from Twitter, but this time, follow along, as I will use Twitter sparingly, in an experiment to find how media continues to evolve.